Track automation events will send MIDI messages to output device and channels that defined for current track (button "Track settings"). To enable automation events and sending automation MIDI messages click on checkbox "Enable track automation". Hint: When this checkbox is set to off automation graph not displaying on the pattern grid and automation MIDI messages will not be sending to output. But automation events aren't removed from the pattern. Automation title could be used as additional information about current controller (as memo). To use this title in other control elements set checkbox "Set title". Otherwise, for any other automation elements will display only controller number. 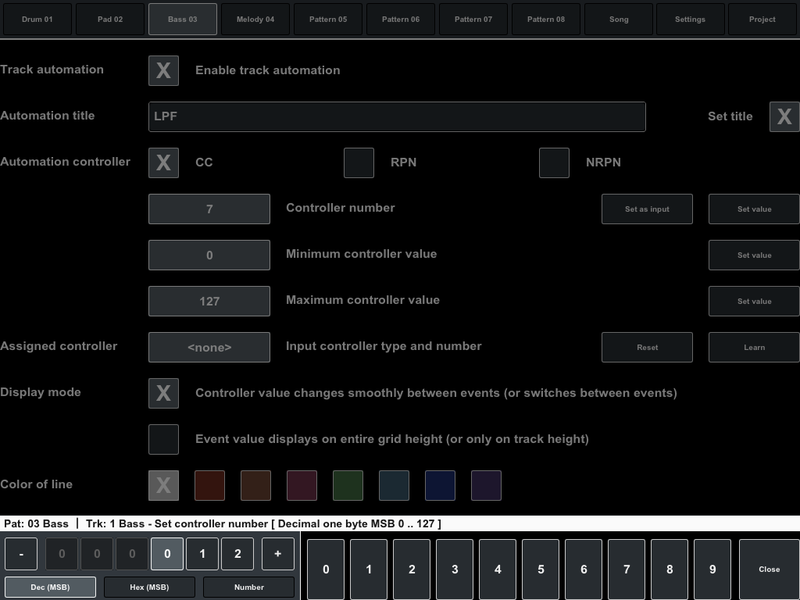 Checkboxes "Automation controller" select the type of output MIDI messages - CC, RPN or NRPN. To set the controller number click "Set value" button (in the same line). 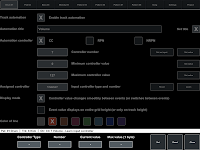 In the "Set controller number" panel you can select various ways to entering value - Decimal (only MSB for CC controller or MSB and LSB for RPN/NRPN controllers), Hexadecimal or single decimal Number (for all type of controllers). Controller number for simple CC messages it is one-byte number from 0 to 127. RPN and NRPN controllers have two-bytes number that can be represent as value from 0 to 16383 or two values MSB and LSB from 0 to 127 (or hex values from 00h to 7Fh). 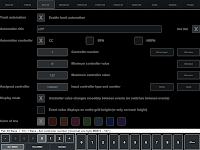 Click to "Set as input" button to set automation controller type, number and maximum value the same as defined for "Assigned controller" (if this controller defined). 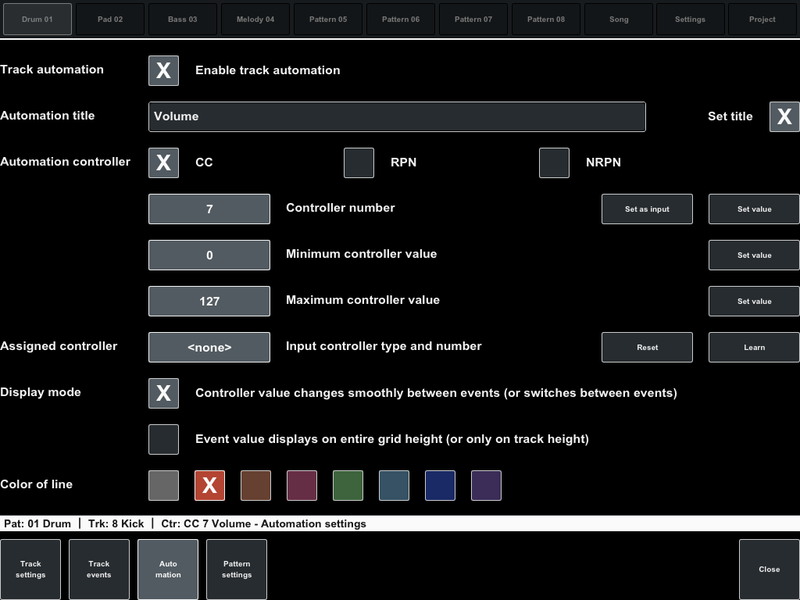 Minimum and maximum controller values will limit value that can be set for the automation event. It is useful when you need to change the controller value only in certain range. Hint: Minimum controller value cannot be greater or equal the maximum value. Maximum controller value also defines how many data bytes sending in MIDI messages. At values up to 127 will be sent one-byte data (MSB byte only). At values from 128 and up to 16383 data will be sent as two MSB and LSB bytes. Hint: Usually most of controllers have a single data byte with value from 0 to 127 (only MSB byte). To assign external input controller for track automation click "Learn" button in the same line and use (turn, move or switch it) external controller to send messages to sequencer. 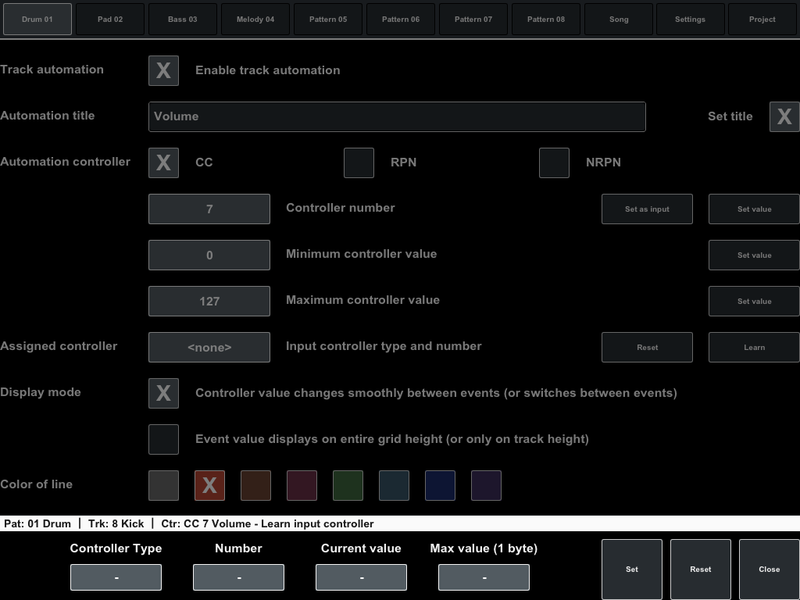 In the "Learn input controller" panel should display external controller parameters. Click "Set" to assign input controller or "Reset" to clear. "Close" button will close panel without changing. Hint: Assigned input controller can be differ from current automation controller. 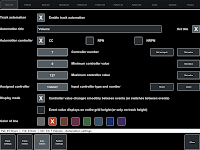 In this case value from input controller will be sent with current controller type and number. To reset assigned controller click button "Reset". Two display mode checkboxes define how automation graph will be displayed on pattern grid. First checkbox also defines how often automation values will be send. When first checkbox is set, automation values will change smoothly from event to event and each change will be send as output MIDI value. Ie MIDI messages will be sending even between separated events (which are visible on the pattern grid) if they values are differed. When checkbox not set, values will be switched for each next event and MIDI message will be sent only in time of event. Switching mode (checkbox clear) more suitable when automation is recorded from external controller. Second checkbox defines how automation graph will displays on pattern grid. When it set point of event will displays on entire height of grid or each track automation graph will displays only on own track height.